Recent Brexit development updates from the UK government and the EU commission have given us an insight involving the process and time frame of Brexit. The UK government aim to enhance existing workers’ rights therefor it is predicted that Brexit will have minor impact on occupational health and safety. The two year countdown is well under way to the UK’s departure from the EU which is expected in spring 2019 and also a White Paper on the Great Repeal Bill, due in the next parliamentary session. One of the key arguments for leaving the EU has been the strict environment, health and safety regulations. Among many REACH has been identified as the most burdensome for small and medium size enterprises. Most EU-derived OSH law is already transposed, but the small amount of directly applicable law, such as REACH, will need a UK version. It is intended that the updated version will provide consistency and continuity. 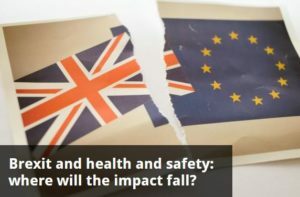 As it is still uncertain of the implications of Brexit on the REACH regulations such as whether the health and safety regulations will still allow chemical manufacturers free trade across the EU market. It is important for us all to keep updated on the possible implications that may affect or benefit the industry going forward.